In case you didn’t know, Bushwick Daily's coverage is about more than Bushwick. We cover East Williamsburg, Bushwick, and Ridgewood, right over the border in Queens County. Ridgewood is a neighborhood full of great food and history. Even better, Ridgewood has great cheap eats, places that represent all corners of the globe for $10 or less. And since readers loved our cheap Bushwick guide, here's another option for budget friendly food spots. Where will you eat first? Share your best bites with us on Instagram @BushwickDaily and bring cash as you explore the taste of Ridgewood. While in Kathmandu is a slice of Nepal in Queens. Sit in the backyard if it’s nice out and enjoy momos, lentil pancakes, and specialty tea and coffee. They’re open for breakfast and cash only. Cachapas y Mas deals up their namesake cachapas - Venezuelan corn pancake sandwiches stuffed with all kinds of meats, cheeses, sauces.The steak version is $10.00 and the cheese one is only $8.50. They also have patacons, a sandwich made out of green plantains instead of bread. At Martinello’s Pizza, a 12-inch cheese pizza is $9.95. They call it a personal pie but it’s definitely enough to share. Their Sicilian slices are worth a try as well. Onderdonk & Sons is known for its beer selection but the $8 burger is noteworthy as well. They run a beer, burger and fries combo during happy hour that is worth sneaking out of work early to try. Jorge’s Restaurant is right by the subway and their $7 pernil mofongo with green plantains will solve many problems. They also have great $4 batidos including the hard to find guanabana or soursop. The Seneca is an all-day bar with breakfast tacos (2 for $6), a $7 burger with special sauce, and a little gem salad for $9. Drink responsibly with all the snacks. Nowadays is the perfect spot for day drinking and the food is cheap too. Hot dogs are $5 and a bratwurst is $10. Check their calendar for concerts and other special events. Little Egypt is a family owned restaurant with Egyptian comfort food. They’re known for their Koshary, a dish of mixed rice, lentils, macaroni, noodles, and chickpeas covered with garlic homemade tomato sauce. It’s topped with fried onions and served with garlic vinaigrette dressing and a generous serving is only $4.95. The lamb kebab sandwich is only $5.99 and comes with salad and tahini sauce. Bring friends so you can share a bunch of dishes. Taqueria Kermes is known for its fish tacos, which are served baja style with mango slaw. They’re $4 each and so is the crispy shrimp taco. They also make fresh churros and you can get a massive portion with chocolate sauce for $9.50. Gyro World has beef or lamb pitas for $9.95 and their homemade spinach pie is flaky and satisfying after a long day. 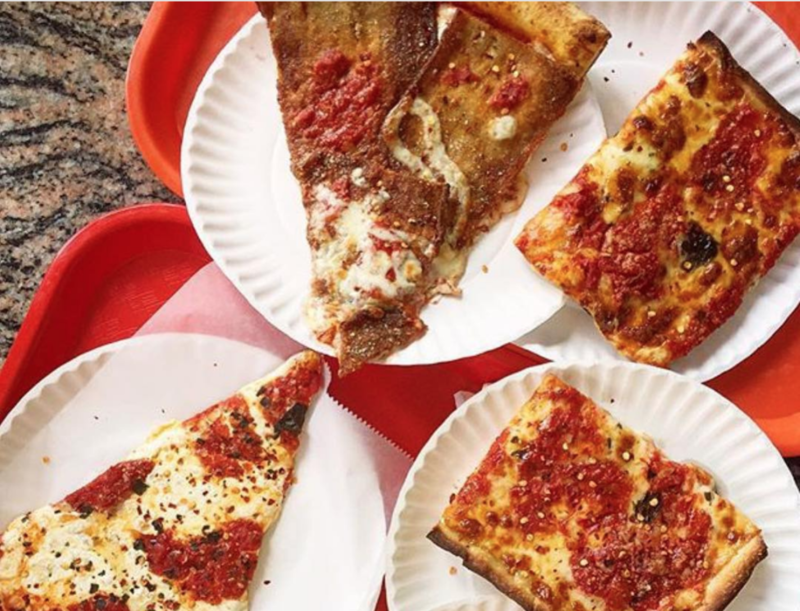 Rosa’s Pizza is a Queens favorite, open till 1 am and known for its grandma slices. They do crazy toppings too, like a ravioli topped slice, but we love the classics too. Norma’s Corner Shoppe is named after the owner’s grandmother and the entire menu is under $10. They serve fresh baked treats, breakfast sandwiches, and homey lunch options like a tuna melt and a beloved spicy bacon sandwich. In the morning, their New Yorker Bacon egg and cheese is one of the city’s best. See if they have the german de leche brownie, a hybrid of a german chocolate cake with dulce de leche. Cafe Esencia makes sourdough churros and a small wheel is only $4.50. Add some dipping milk chocolate and you’re in business. They also have a menu of Spanish sandwiches, like tortilla espanola and and a chorizo bean toast, plus a full coffee bar. Super Pollo serves Ecuadorian roast chicken with a full bar. A half chicken is $7.50 or you can get a ¼ chicken with avocado salad for $10. Or try for 4 empanadas for $8.75 — they have chicken, cheese, beef and pork. Bosna Express is one of the city’s few Bosnian food destinations. They offer Cevapi, a bosnian kebab of beef and pork served with pita bread and white or red pepper salsa. A large one is $7. Also try the Bosnian Burger and add feta cheese for $1.50, it’s imported and so delicious. Joe and John’s Pizzeria has more than just pizza. They’re known for their pasta dishes, the mozzarella sticks (6 for $6) and a small pie is just $9.